M&D Locks and Keys is a true New York City Locksmith, not an out of state call center. We have shops on Empire Blvd and Cortelyou. All M&D locksmith technicians are licensed, insured and highly trained on all transponder keys, keyless entry units, panic buttons, ignitions and locking mechanisms, electronic, digital or standard. Check out our 5-star reviews in Yelp, Google and Angie’s List – we’ll give you the same 5-star service. If so, you’ve found the solution. M&D Locks and Keys is a highly specialized automotive locksmith company. Our mobile units are equipped with state-of-the-art lockout technology—we’re talking specialized equipment that most other New York locksmiths don’t have. With our unique lockout technology, we can program your make, model and manufacturer information to make you a new key on the spot, even if you’ve lost your keys. Transponder keys? No problem. You don’t have to come back to the shop. Our mobile unit is equipped with all the technology needed to get you on your way, fast. In fact, our lock and key technology is so advanced, many new York locksmiths refer their clients to us. Learn more about our key replacement technology here. We’ll get to you in 20 minutes or less. Transponder and remote access car keys are our specialty. Broke your key in the ignition or door? No problem, call now. No Keys? Well make you a new one—on location. Mobile units in all 5 boroughs. There’s one near you now. The NYPD, FDNY and New York City Sheriff use M&D Locks and Keys. All our locksmiths are licensed, insured and trained. 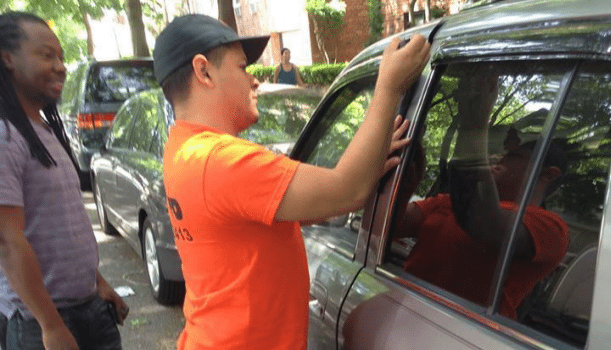 We know the scams as well as the tarnished reputation the locksmith industry has received over the years, especially in New York City. M&D Locks and Keys has been an outspoken proponent of stricter locksmith laws and regulations. Never trust a locksmith that shows up in an unmarked vehicle and especially one that cannot produce a valid locksmith license. We know trust is important. Our goal is to make you so satisfied with our services that you’ll not only write a good review for us in Google and Yelp, but that you’ll add our telephone number to your mobile device should you need us in the future. We’re contributing members of the New York community and are here to stay. We have two shops in Brooklyn and mobile units that patrol areas throughout the city. We’re trusted by the NYPD, New York City Sheriff, the US Marines and countless New York businesses such as Armani, Sleepy’s New York, Geico, the New York State Retirement System, Ted Baker Manhattan, Brookdale Residence and PM Pediatrics of Brooklyn as well as many others.